In 2009 BoDean installed variable frequency drive units at its asphalt plant. When a slowdown in production occurs, it might not be feasible or advisable to shut all motors off. For convenience, cost-efficiency, and precision, we are able to change the frequency through VFD technology. By replacing old motors and installing new variable frequency drive units, we are able to lower the tremendous amount of energy they consume. We can conveniently adjust the speed and torque of a motor by changing the frequency applied to it. A reduction of GHG by 121.25 tons per year, lowered gas consumption of the burner system as a result, ($22,000 savings per year). 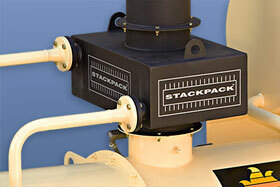 In 2009 BoDean Company installed a “Stackpack” heat recapture module at its asphalt plant in Santa Rosa. In order to produce asphaltic concrete (AC), a large amount of heat is necessary to dry the aggregates that are used in AC, and to heat the binder oil so that it can stay liquid in order to cover or coat the rock and sand. By the use of a special module called a “Stackpack”, we are able to capture the heat exhaust in this process so that it may be re-used. A reduction in GHG emissions by 18.3 tons per year, lowered natural gas consumption, monetary savings of about $7,600/yr. leading to greater profitability.